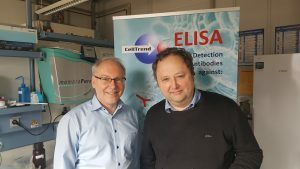 CellTrend GmbH was founded in 1998 and has ten employees. CellTrend is a biotechnology company and is working as a contract research organisation for the pharmaceutical industry. CellTrend is performing cell based Bioassays with the focus on oncology and immunology. Furthermore, CellTrend develops, produces, and distributes Immuno-Assays e.g. ELISAs (enzyme linked immuno sorbend assay) which is a quick and sensitive analytical method that is characterized by specific binding of antibodies to analytes. Various validated diagnostic and research test kits are available. If required, samples are analysed in CellTrend laboratories. We also offer to develop new ELISAs for your analytes. CellTrend is certified according to ISO 9001:2008, ISO 13485:2003 (medical devices), and ISO 13485:2003 CMDR (Canada Medical Devices Regulation). Our Total Quality Management affects all processes and has been developed to fulfill our customers’ needs. Our personnel are extensively knowledged and practically trained. We strictly adhere to the rules of GMP (Good Manufacturing Practice, FDA). In 2006 CellTrend developed the ELISA for the determination of Auto-Antibodies against the Angiotensin-II-Receptor-I. The assay is patented worldwide (European patent number 1393076). The assay is validated according to the Guidance for Industry: Bioanalytical Method Validation, US FDA May 2001. New publication in Frontiers in Bioscience about: Anti-ß1-Adrenoreceptor auto-Antibodies in elderly heart failure patients.